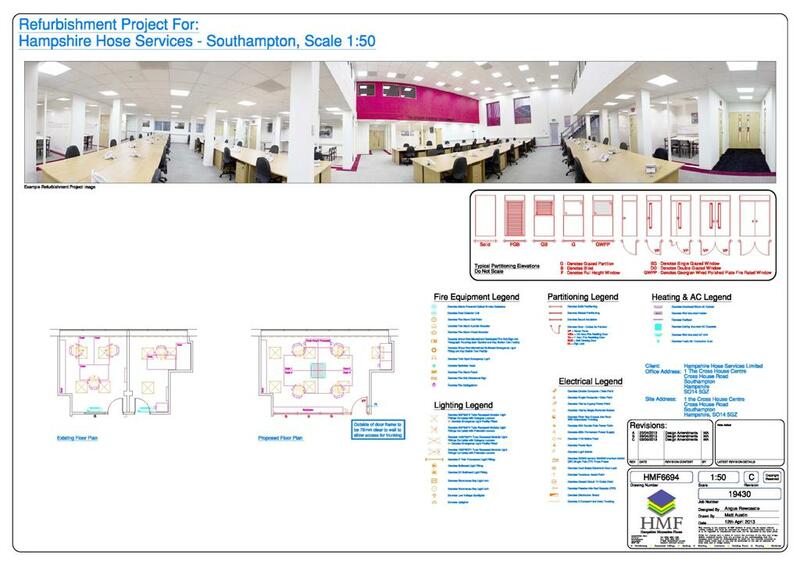 Hampshire Mezzanine Floors were asked by Hampshire Hose Services to upgrade their existing Southampton office facilities. Hampshire House Services Ltd have been in operation for over 27 years and are recognised as market leaders in the supply and manufacture of hose fitting and assembling. Hampshire Hose Services Ltd, who provides industries with a wide range of hydraulic and pneumatic products and services, required their two existing separate office areas which were side by side to be opened up into one large open plan office. Hampshire Mezzanine Floors organised the structural block work removal and also modifications to the existing partitioning and ceilings. HMF provided new glazed partitioning and also supplied and installed a new suspended ceiling. HMF then redecorated the office and provided new window boards as well as heavy duty contract grade carpet tiles. The project was built as a fast track programme to minimise the disruption to Hampshire Hose Services and structural elements were carried out at the weekend. Hampshire Hose Services fitted their own new desk systems to maximise the space and functionality of the office. The office area is a great place to work with good natural light and available space to work in.